Four Great Seasons, One Outstanding Destination Lake George, N.Y. - The 2013 Travel Guide for The Lake George Area in New York&apos;s Adirondacks is a must-have guide to planning a getaway to this four-season destination! No matter what the date is on the calendar, there are seasonal attractions, recreation, dining and lodging choices to fit any vacation style imaginable. Take a look at the possibilities that can be planned with this Guide Looking for a sandy beach and refreshingly cool water lakes? Choose from 32-mile long Lake George or a host of smaller, more intimate lakes which are scattered about the region. How about a mountain retreat to get away from the wired, high-tech lifestyle that has become the norm? Cottages, cabins and campgrounds far and away from the crowd offer peaceful relaxation at its best. And outdoor recreation at its finest is yours for the asking. Couples who need an escape will find quaint Bed & Breakfast inns, exciting nightlife, a microbrew/winery tour, and romantic dining . . . The Lake George Area is the quintessential family getaway and has been for generations. Favorites like amusement parks, lake cruises and souvenir shopping are joined by new favorites like a high ropes obstacle course, stand-up paddle-boarding, indoor water park and model railroad attraction! A weekend with friends? A fishing week with the guys? A spa weekend with girlfriends? A scenic weekend drive on back-country roads? The possibilities are endless. 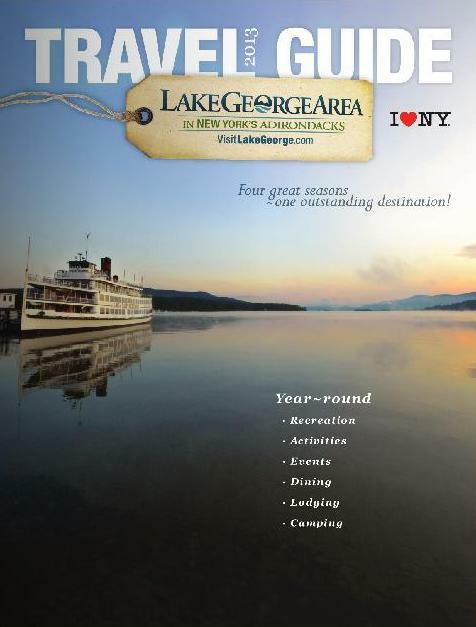 For a free copy of the 2013 Travel Guide to the Lake George Area in New York&apos;s Adirondacks, go to http://www.visitlakegeorge.com/or call 800-365-1050 X5100. Travel Editor: We invite you to share this timely information with your readers in print and/or include a link on your website- Your readers will thank you for it!